Welcome to my internet journal. I have spent over 20 years in the corporate business world and I am a professional artist. I will be commenting on my current artwork, the art world in general, and the world in general. I posted a WIP image of this on April 12, 2009, and have finally completed the painting after starting and stoping many times. 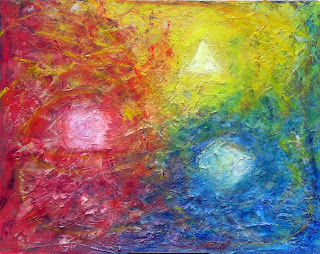 The idea behind the painting is to present the concept of the Blessed Trinity graphically using the metaphor of the primary colors and primary shapes to represent the Father, Son and Holy Spirit. God the Father is yellow, the warmest and brightest of the primary colors. The triangle symbolizes perfection, thought, and creative power. Jesus, God the Son, is red to symbolize his martyrdom. Red is the color of love, courage and human passion. It symbolizes the humanity of Jesus through the blood that ran through his mortal body. Likewise the square is the symbol for the earth, the domain of humanity. The Holy Spirit is symbolized by the cool fluidity of blue. The circle symbolizes relaxation and smooth motion. It represents the guidance, inspiration and grace that we receive from the Holy Spirit. I have also worked with the composition to give it a feel of depth with the blue circle moving closer to the viewer and the yellow triangle moving to the background. 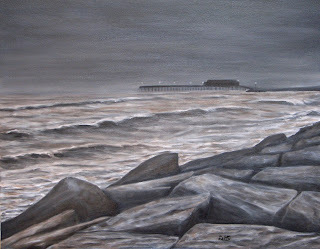 Here is the finished version of Galveston Waits for Ike - unless I begin to obsess over some of the details.